Knowing and witnessing are two different things. The former deals with thoughts, whereas the latter involves confronting reality up close. “Kill Ahn Young-ho” is a drama that forces the audience to confront the realities facing teenage runaways. By showing us this story of three marginalized young people who have run away from home and the violence and difficulties that pushed them onto the streets, the work invites the audience to empathize. Once you meet these alienated teenagers -- though they are fictitious characters -- it is difficult to play innocent. “Kill Ahn Young-ho” ended its three-day run at the Doosan Art Center on Saturday. 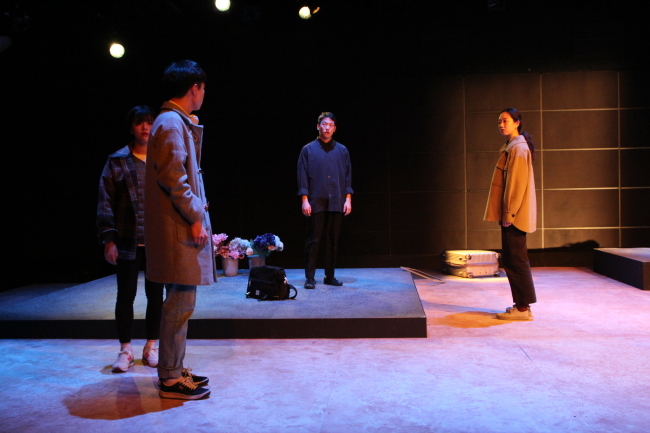 The hourlong work was produced by Project Godot, a college student theater production team led by director Ko Yu-been and playwright Kim Do-eun. “Our previous work dealt with female high school students, but the story remained within the high school setting. For this production, we set off to find a story that unfolds outside of school,” Ko said during an interview with The Korea Herald on Thursday. “Once we decided to talk about runaway students, we tried to look into research by experts and carried out interviews with actual runaway teenagers who were staying in shelters. It was not difficult to find youngsters who had experience with runaway families too,” the director continued. A “runaway family” is a group of teenagers who meet in internet chat rooms and develop relationships so they can survive on the streets. “Kill Ahn Young-ho” starts with a scene near a quayside, where three teenagers have arrived after killing Ahn Young-ho, a man who financially exploits runaway teenagers. The three teenagers at the quayside are haunted by the specter of Ahn following them. From then on, the story moves back and forth between past and present, showing how the children ended up killing Ahn. “I knew there was such thing as a ‘runaway family,’ but it was a little vague. It was in the process of making this work that I learned a great deal about the actual conditions that drive children to life on the streets,” Ko said. In the play, the three teens find each other online and form a runaway family with Ahn as the “father.” Together, the foursome gets through life by cheating and exploiting other runaway teenagers. But one of the three teens feels guilty and rebels against Ahn. As Ahn starts to ask more from the teens and becomes an increasingly violent “father,” the three decide to escape. But Ahn finds out and uses force to stop them. That’s when the rebellious character hits Ahn on the head, killing him. “I hope the play will appeal to the audience and help them understand runaway kids a bit better. I also hope the work will make viewers think about fatherhood,” Kim said. Asked whether they would continue to produce works on women or children, the two said they would continue to include and highlight women’s voices. “I think there can be more stories since there have not been many productions about women, and actually more people are now making such productions,” Kim said. “The female characters in the theater scene here are very standardized -- prostitutes, for instance. We hope to broaden the range and feature a variety of female characters,” Kim continued. 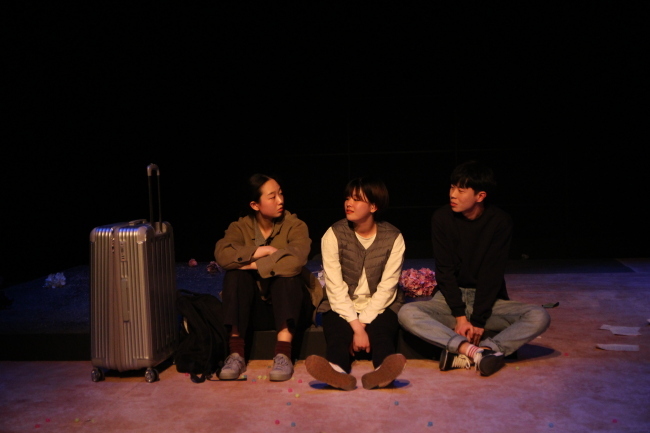 “Kill Ahn Young-ho” was the fourth of six plays staged this year as part of the Doosan Art Lab, the art center’s annual program dedicated to supporting theater producers under 40.